The case in which the Linyungandambo Chairperson Afumba Mombotwa and three others are charged with treason and sedition failed to take off Tuesday for the third time and has been adjourned to 26th January 2015. And one of the accused, Masiye Masiyaleti has told the Zambian Watchdog that the State arrested him to be used as a state witness against Afumba and the two others but claims that he rejected the deal. Afumba, who is the Administrator-General of the Barotseland transitional government, is jointly charged with his Secretary of State for Agriculture Likando Pelekelo, Secretary of State for Legal Affairs Sylvester Kalima Inambao and Deputy Secretary for Defence Masiye Masiyaleti. The four accused appeared before Magistrate Matipa at the Mumbwa Magistrate court facing treason and sedition but the case could not proceed as the prosecution is still awaiting instructions from the Director of Public Prosecution (DPP). 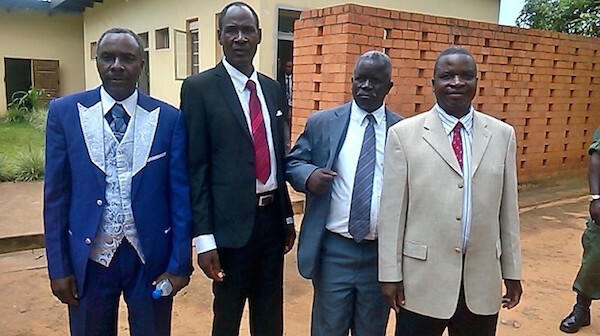 Particulars of the charge are that on unknown dates but between 1st March 2012 and 20 August 2013 while in Sioma District of Western Province and jointly acting together with other unknown persons, the four allegedly attempted to secede Western Province from Zambia. And Masiye who was arrested on 22nd December when he went to attend the hearing for Afumba and the two others claimed that the state arrested him so that they use him as a state witness against Afumba and the other two but he rejected the deal. Masiye claimed that the state is adjourning the case because they don’t know how to proceed following his refusal to be used as a state witness. The four are detained at Mwembeshi prison.